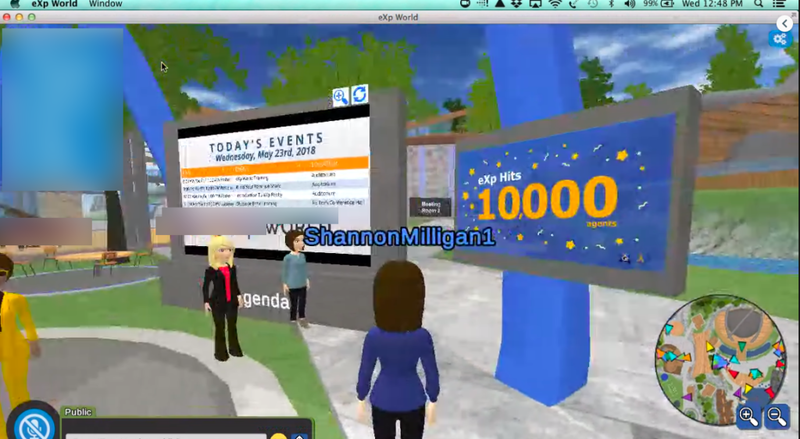 EXp Realty is a virtual, cloud-based brokerage founded nearly a decade ago. But what sometimes flies under the radar about the remote real estate company is that its 11,000-and-counting agents don’t just talk via Slack and on the phone: they log on to a full-fledged virtual world called eXp World, reminiscent of The Sims or the massive online multiplayer game Second Life. After a few months writing about the rapidly growing eXp Realty — including its milestone trading start on the Nasdaq, passing a $1 billion market cap on its first day there, its expansion to 49 states and two Canadian provinces — I got curious about what that world actually looked like. 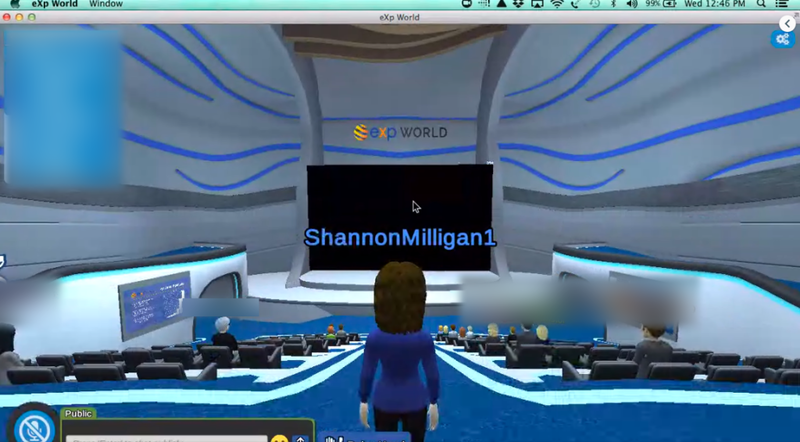 I asked Shannon Milligan, an eXp agent based in Richmond, Virginia, to give me a tour of the eXp World’s virtual landscape. Milligan joined eXp in 2016 from Keller Williams and was one of the first agents with the brokerage in her region. She was persuaded to make the switch by eXp’s other distinguishing feature: it awards company stock to agents as a reward for hitting transaction benchmarks and recruiting new agents. The virtual reality of eXp World’s office was something new to Milligan, who had heard of games like The Sims but hadn’t played them. I wanted to see how eXp agents used the virtual world in their day-to-day work. 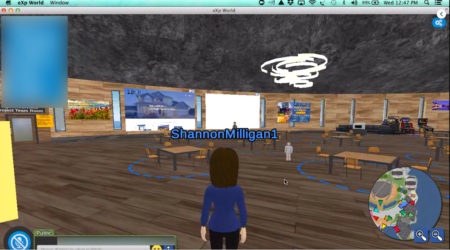 “It was just that uneasiness you have in the real world when you start a new job and have to get acclimated,” Milligan said about her experience getting used to her new virtual office. Like Milligan, I don’t have much experience with virtual reality computer games. Both of us stand in contrast to eXp Realty founder Glenn Sanford, a self-avowed nerd who inspires comparisons to characters from The Big Bang Theory. 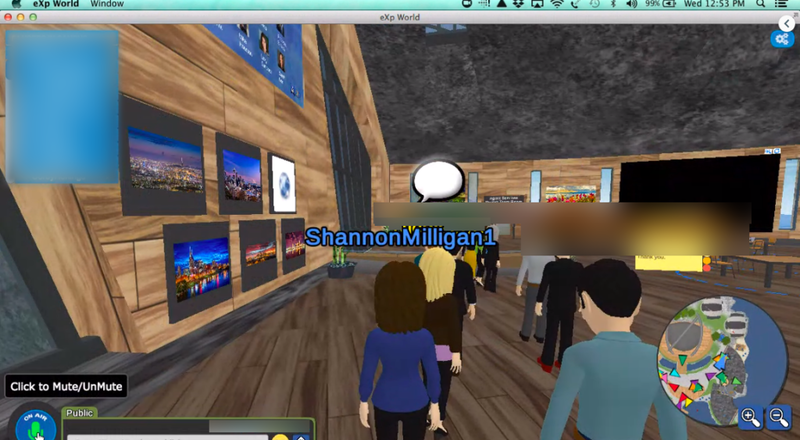 An eXp Realty spokesperson said that the virtual world is not inspired by The Sims, but Sanford said that he was influenced by Second Life. The technology is provided by the company VirBELA, which has also built virtual tools for universities and virtual classes like Coursera. “In 2009, when we looked at how to create a sense of place that was always on and available, virtual worlds for business made a ton of sense. I had built a large online service in the early ’90s and had worked for AOL for a bit back then as well, so online communities made sense to me,” Sanford told Inman. 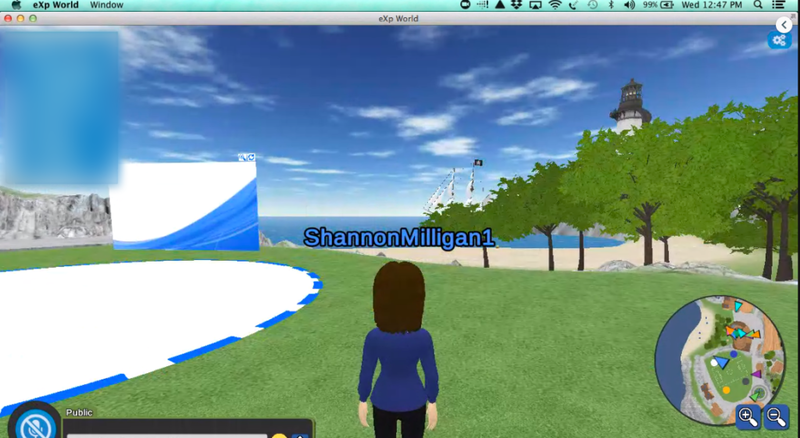 When Milligan and I logged on to eXp World’s office, sharing her screen through Google Hangouts, I was surprised to hear lots of voices. 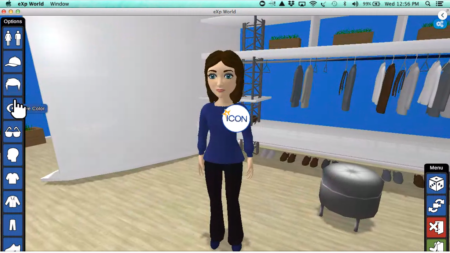 Every agent has an avatar — crafted like a Bitmoji with options for clothes, hairstyles and eye color — but everyone talks out loud through their computer microphone. If you want to have a private conversation, you step inside dotted-line circles that surround tables and other gathering areas, cutting off others from hearing your conversation. But if you speak out loud anywhere else, anyone who’s logged on to the platform can hear you. In the bottom-right corner of the browser, there’s a map where you can zoom out and see more of the virtual campus. Agents’ avatars mill about the eXp campus, looking at the schedule of training events that day posted on central boards. EXp tries to build company morale, too, with signs celebrating the brokerage recently hitting 10,000 agents. 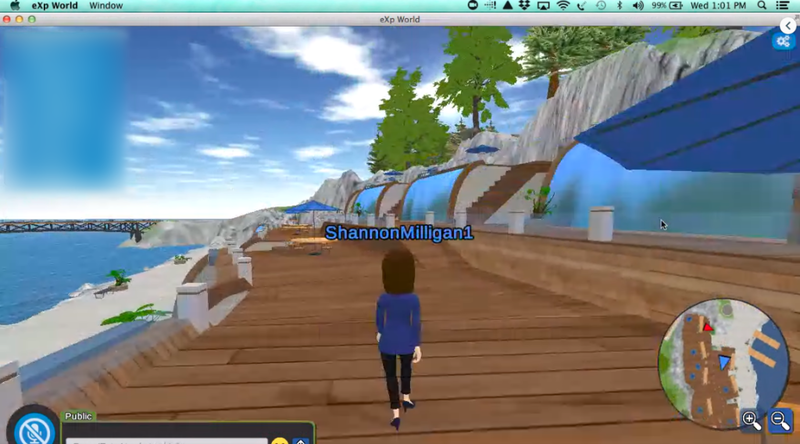 You can wander around the eXp campus using the arrow keys on your keyboard, but Milligan prefers to use the platform’s menu to click “go to” a new destination and then instantly appear in a different part of the campus. In virtual reality, eXp can build a corporate campus of a scale usually reserved for Apple and Google. There are auditoriums, a soccer field, rooms for each state’s eXp operation with themed decoration — Milligan’s says “Virginia is for lovers” — and even a beachside patio where the water makes ocean sounds. There are also rooms for tech support, human resources, eXp Canada, accounting and a space for brokers. “By creating specific places on campus, we are able to divide up the work and the teams into logical places that make sense visually,” Sanford said about the virtual campus. “Additionally, because of the vastness of the campus, if agents want to mastermind, hold ad hoc classes, etc., it is easy to do by simply finding a place on campus to do that from,” he added. The virtual version is a far cry from the usual real estate office, with a few conference rooms and some free coffee for clients. Of course, in eXp World, there are no clients. That all happens in the real world, where eXp agents still have to drive around and show clients houses themselves. EXp World is reserved for intra-brokerage business, mostly training sessions and human resources questions. Milligan said she only usually logs on to ask an accounting question or to visit eXp’s agent services department. Standing around a central office, we run into an agent who works in Milligan’s region in real life. Milligan quickly said hi to the new agent who was trying to figure out how to attend a training session. “She just came on this week. She’s still learning it,” Milligan told me after we left the conversation. Next, we explored some of eXp’s lesser-used features: you can make your agent avatar clap and wave. Milligan’s got stuck dancing in the middle of a crowd. “The funniest thing is when you walk into a wall,” Milligan said. One of the quirks you encounter, unique to a virtual reality workspace. Of course, in eXp World, this isn’t all a game. These avatars represent agents in their place of work, and their interactions in this world make up a large portion of their professional lives. If they get stuck dancing or can’t figure out how to get to the auditorium, they can always log off. Correction: This story originally stated eXp Realty had 12,000 agents, when in fact, at publication time, it was 11,000. We have since updated the story accordingly and regret the error.